British satirical cartoon illustrating King William IV shortly after his ascension! This is an 1830 William Heath political cartoon of King William IV and was published soon after his ascension. 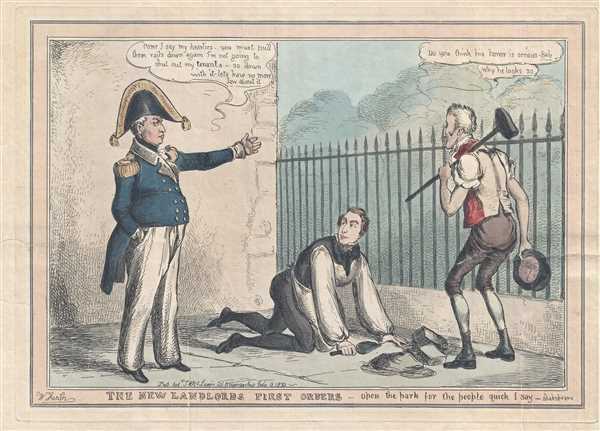 In the cartoon, King William IV is speaking to Sir Robert Peel and Arthur Wellesley, the 1st Duke of Wellington, who are both dressed as workmen. King William IV, dressed in an admiral's uniform (he was often depicted in naval uniform), gestures at a railing and says, 'Come I say, my hearties – you must pull these rails down again. I'm not going to shut out my tenants – so down with it – let's no jaw about it.' The Duke of Wellington, who was Prime Minister at the time, and is illustrated holding a mallet, responds, 'Do you think his honor is serious Bob?'. Sir Robert Peel, the Home Secretary, who is kneeling and holding a trowel, responds, 'Why he looks so'. This exchange is referring to one of King William IV's first popular acts as king, the opening of a public passage between Waterloo Place and St. James Park in London. This cartoon is rather scarce. We were able to locate examples in the collections of the British Museum and the Victoria and Albert Museum in London. It was created by William Heath and published by Thomas McLean in July 1830. William Heath (1795 - 1840) was a British artist best known for his engraving, which included caricatures, political cartoons, and commentary on contemporary life. Early in his career, he focused on military scenes, but after about 1820 he focused on satire. The Glasgow Looking Glass (renamed The Northern Looking Glass after only five issues), the caricature magazine, was partially founded by Heath. Some of his works were published under the pseudonym ‘Paul Pry’. Thomas McLean (1788 - 1875) was a British publisher and printer. He published hundreds of political caricatures in his publication the Monthly Sheet of Caricatures, among others. Good. Old verso repair of tear extending 3.5 inches into printed area. Closed tear extending 1.5 inches into printed area professionally repaired on verso. Blank on verso.